In the late 1980s, after the failure of his long and costly war against Iran, which had lasted for most of that decade, Iraq’s President Saddam Hussein started to cast around for a new target for his warmongering aspirations. His sights alighted on another neighbor, the small but oil-rich Gulf state of Kuwait. 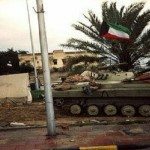 On August 2 1990, under the pretext of a border dispute over oil exports and distribution arrangements, Saddam launched a large-scale invasion of Kuwait with more than 100,000 troops backed up by 700 tanks. Kuwait was quickly overrun and in no time. Saddam was declaring its annexation by Iraq. With customary bellicose rhetoric he threatened to turn the capital, Kuwait City, into a ‘graveyard’ if any other country dared to challenge the ‘take-over by force’. The response of the United Nations was immediate and decisive. Meeting in emergency session, the Security Council called on Iraq to withdraw its forces from Kuwait and imposed sanctions until it had done so. Saddam, however, gave no indication that he would bow to UN demands. Over the following months a US-led Coalition force involving troops from 30 countries was assembled. It was widely assumed that Saddam would back down in the face of intense international pressure, but when he failed to respond to a UN ultimatum for withdrawal, the Coalition forces launched Operation Desert Storm on January 17 1991, a major offensive to expel Iraq and liberate Kuwait. For more than a month a sustained and devastating aerial bombardment of key military targets, including the Iraqi capital Baghdad, brought the country to its knees. When the ground forces finally moved in at the end of February the conflict was effectively over; within days the Iraqi army had fled, Kuwait was free, and a ceasefire had been declared. Death toll: Iraqi casualties are unknown, but estimates of military deaths range as high as 100,000. Some 3,500 civilians are thought to have died in the bombing raids, tens of thousands more from diseases and other effects of war. Coalition troops lost 381 lives, including a number from so-called ‘friendly fire’ incidents. You should know: What has become known as the First Gulf War must rate as one of the most unequal engagements in the history of warfare. The Coalition forces’ equipment, resources and firepower were vastly superior to that of their Iraqi opponents.